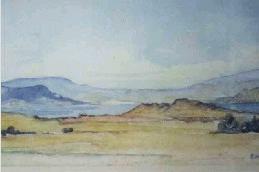 The front cover is a water colour, which was painted by Mac's sister-in-law, Miss M M G Thomson. The prejudices of religion and colour only come later in life. This walk, from the farm house in Kitale led down to the dairy. It wound its way through an area planted with banana trees and a wide variety of other fruit-bearing trees. 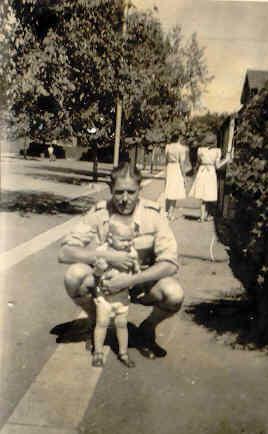 In writing a eulogy for my father - Joseph William McFarnell - 'Mac', I found myself gradually writing a book which took exactly 10 years to complete after his death. Apart from Mac's exploits in creating a framework for multi racial sport in Kenya he campaigned for his own country of birth, South Africa, to adopt a new path away from Apartheid. 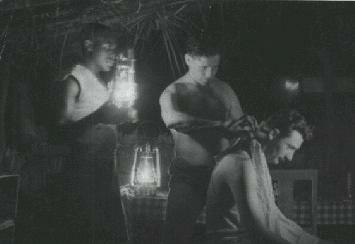 His childhood and family background help to build a picture of his life which was spent mostly in Africa but from 1963 in Britain. This book has been written for family and friends but after much pressure I have made it available for many more who I hope will be interested in this small part of Kenya and sporting history. Joseph William McFarnell as a young man had flair, charm and great skill as a sportsman, which made him a friend to so many people. Ten years ago, I read his eulogy at his funeral, which was very easy to write but afterwards everyone asked so many questions and this inspired me to write a book about his life. This book is mainly written for the family and I make no excuses for the style and content. For the rest of the book, I will use the name everyone used to call my father by and that is' Mac '. The contribution made by Mac to sport in Kenya was enormous. He had the vision to recognise and implement sport where religion and colour ceased to be a factor. The land of his birth, South Africa followed another path and the cruel and unjust regime of Apartheid was to blight and eventually incur sanctions that ultimately forced a return to an acceptable code of conduct. The bulk of the book consists of a letter Mac sent to Nelson Mandela. The letter, which conveys Mac's strong convictions and remedies that were never delivered. The State President of the Republic of South Africa, P W Botha wrote a personal letter back to Mac to explain why Nelson Mandela would not be given the letter. Rafiki is the Swahili word for friend and Mac regarded friendship as very important. It was only through the friendships that he forged that he was able to gain so much support for his ideas. I must thank everyone who has helped to make this publication possible. My mother has at times found my probing for memories difficult and a challenge but with each draft new and interesting insights emerge. I am sure that if further editions are requested, there will be many additional pages. The crowd rose hostile and abusive as the football was passed to the striking figure of the opposition centre forward who took the ball with ease and grace. Cries of "Kaffir! Kaffir!" filled the air as the centre forward scythed through the defenceless backs. A pale and shaken young lady watched in the stands in bewilderment as her husband took the crowd to fever pitch. What on earth could have caused such fury and vocal uproar? Surely talent so obvious to even the young lady was not sufficient to provoke crowd hysteria of such magnitude. The ball blasted towards the top right hand of the goal and only the agility and strong fingers of the goal keeper retained a blank score sheet. The young lady who had married the young man a month ago knew that he attracted attention by his good looks and fine physique but she was stunned by the reception that he received each time the ball was passed. Inevitably, the skill and power of the centre forward defeated the luckless goal keeper. The chant of " Kaffir!" now appeared given in respect to the success of the unstoppable centre forward. As the final whistle blew the crowd dispersed, their anger and frustration vented on the wizardry of one player. Alone in the stand the young wife waited patiently for her husband. When he emerged, he was casually dressed and no one would have guessed that he could have caused such passion to erupt over the last couple of hours. This was the first time my mother had watched my father play football. This story is about the contribution my father made towards the development of sport and his fight against apartheid in Kenya. In 1948, multi-racial sport was not considered wise. White against African or Asian would lead to fights on and off the pitch. But our story starts on the 14th June 1919 in Pretoria, South Africa when Mac was born in a country where the white man was boss and coloured people the servants. The marriage of Mac's father, John William to Fredricka did not last for very long. His father was much older than his mother and he was badly injured at Deville wood, France in World War I. As a result, Mac went to live with his grand parents. His grandmother was a little Yorkshire woman who on all accounts exhibited an enormous amount of energy. Her first marriage had been to the Count Von Wilburg, who owned and ran a large hotel in Barberton. The Count had run a lucrative side line in staking out gold diggers. When the Count died, grandmother married a Mr Hockstetter, who ran an estate agents and financial brokers business. They lived at Eloffsdal, a very grand residence with over one hundred different fruit tree varieties in the vast gardens. A reception dinner would see all the leaders in South African Society of the day attending. Jan Smuts was a regular visitor. Even in these early days, ideas of Apartheid were being shaped. Mac was greatly influenced by his grandmother's views that everyone was equal in the eyes of the Lord. Rubbing shoulders with these politicians and business men was a great advantage and he developed an awareness important in later years. At fourteen, Mac went back to live with his mother and this period became a blur. Mac left school at the age of fourteen and little of his life during this period was disclosed. He worked for a period in a circus. He learnt to cut hair as a barber. During this time discovered his aptitude for figures which led to his career in accountancy. He had developed football and boxing skills during this time and at eighteen he represented Transval in football. A magnificent cuttings book reported on his achievements pre-war. Alas, this was lost and just a few cuttings from 1943 Germiston Soccer Gossip remain to give a taste of the reports. Mac had a step brother, Tony, and a step sister Molly. Molly's address Devil's Peak, Table Mountain, Cape Town conjures up an image which is South Africa. Distance and age meant Mac never formed a close relationship with Tony or Molly but he thought of them with great affection. 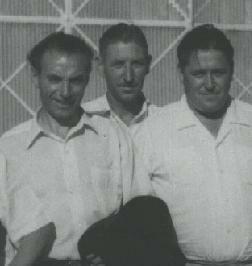 It took a world war to end Mac's football career and in 1940 he joined the South African Royal Engineers as a volunteer. 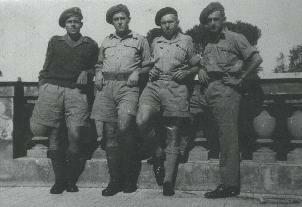 In fact, his whole office where he was working at the time became a unit in the South African Royal Engineers and were posted to East Africa. The South African forces joined the Allied forces in the Italian Campaign. The journey through Southern Africa to East Africa took over seven days. The dust of the convoy under the hot dry conditions made life difficult for all the young men on their way to war. The river beds glistened and shimmered without a trace of water as they snaked across the sun burnt grasslands. The teaming game, wildebeest, zebra and buck watched as the trucks nosed their way north. 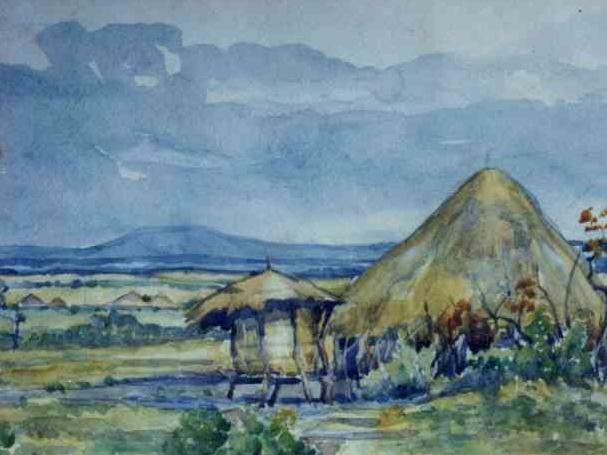 The camp fire conversation was restricted to the single thought and anticipation of the moment when they reached their destination and a glass of ice cold beer would wash away the week of dust and to be able to feel the condensation on the cool glass with a finger.Mac's first stop was Kitale where he drove supplies to and from base headquarters at Lokitung. 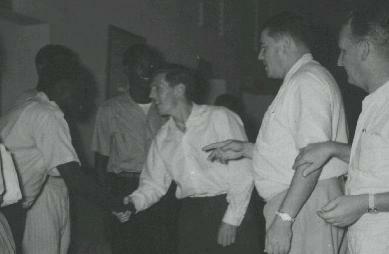 As light relief for the troops the local people organised a dance in the canteen. Troops from several surrounding units were invited to intermingle with the local girls, who blossomed with the adulation they received from, budding Casanovas. Mac entered the room to the big band sound of Tommy Dorsay blazing out from the army band. The floor was awash with the relaxing soldiers trying to forget their fears in a whirlwind of dance.As Mac surveyed the scene he noticed a reserved young lady pouring tea for his superior officer. He slicked back his jet black hair, straightened his uniform and made a decision that would alter his Iife. As he approached the young lady his nerves got the better of him and he spluttered out a word of greeting - the women smiled as he whisked her away on to the dance floor. His pulse raced but his athletic body moved with in perfect rhythm and time to the music.He learnt that this beautiful young women was Stella Thomson, daughter of Major Thomson and his wife Elisa. Courtship was not easy but love prevailed and Mac proposed under the blossoming lucky bean tree which stood proudly on the front lawn of the farm where Stella lived with mother, father and her two elder sisters, Pat and Gill. 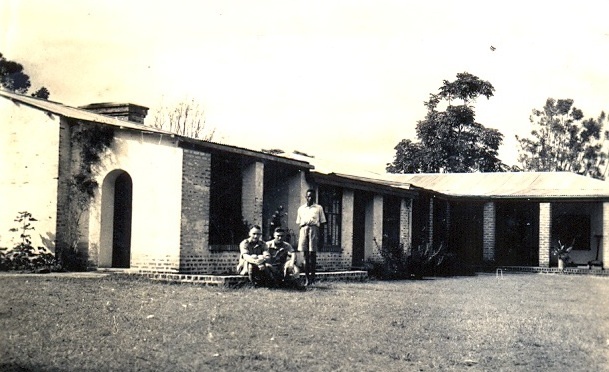 Stella's home, the farm at Kitale was purchased in 1925 by Major Thomson. ( Stella's father ) He had fought in East Africa in World War I and when the Colonial Office set up a lottery for land in Kenya, he applied. 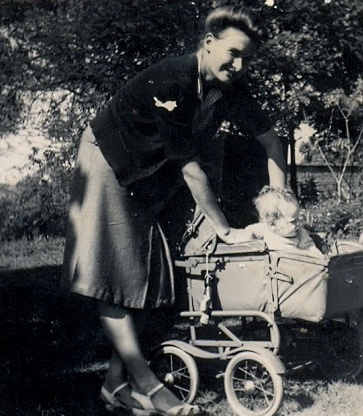 His wife, Elisa was not keen to go to go to East Africa but was prepared to go to South Africa. 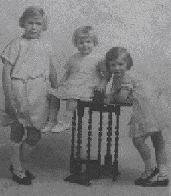 He and his young family, his mother and a Mr and Mrs Harmer emigrated from England to South Africa. In Grahams Town, he let on that he had won this land in Kenya. It was decided that he should go ahead and look at the land but he only got as far as Durban when he was rushed to hospital with appendicitis. 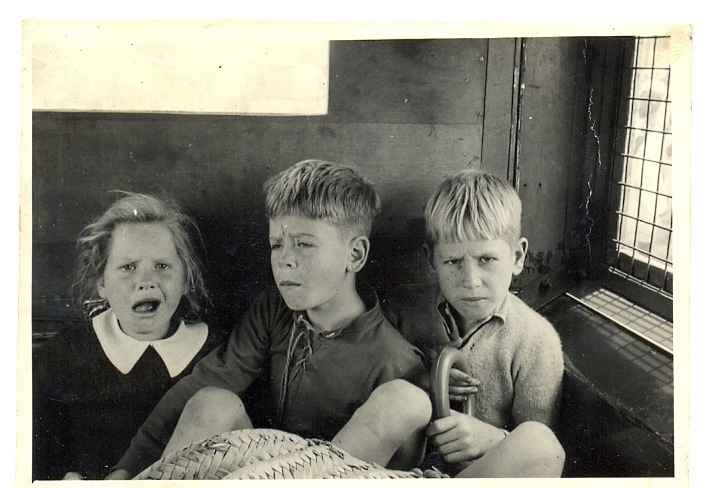 Elisa joined him in Durban leaving Pat, Gill and Stella in Grahams Town with the Major's mother.When they eventually arrived in Kenya the lottery land had been allocated. At this point they decided to buy 400 acres from Mr Kirk in Kitale. 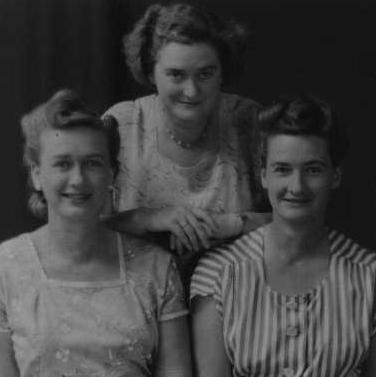 Stella, her sisters, Pat, Gill and grandmother left Grahams Town by boat for Mombasa. They traveled from Mombasa by train as far as Nakuru. The last section was made on a wagon pulled by oxen. The model T Ford was an exciting new mode of transport. It took a life time to convert the 400 acre highland grassland into a mixed farm with maize, sheep, pigs and later cattle when the farm had been cleared of ticks. In 1938 a further 600 acres was purchased from Harry Taylor. 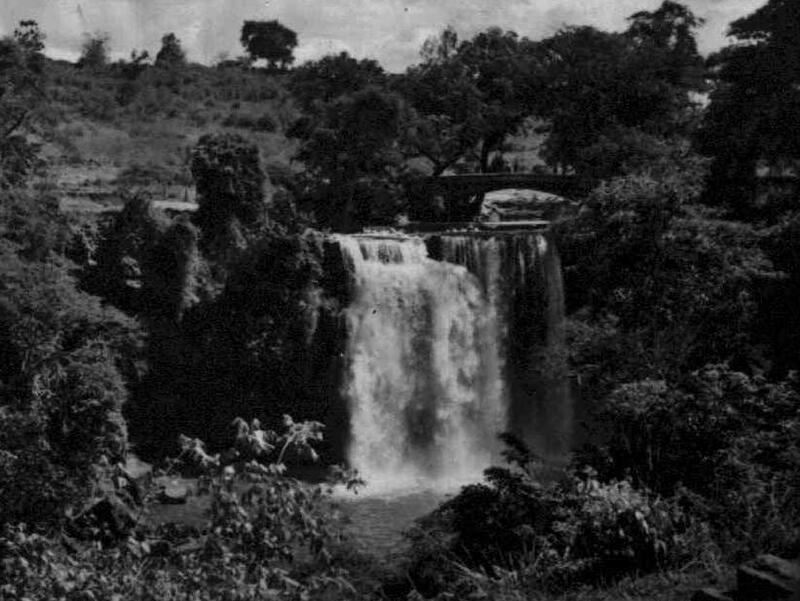 This was a section of land that extended the other side of the river which had its source at the foot of Mount Elgon. The Major built a comfortable house with many rooms. In the picture ( left ) we see the front lawn and the veranda. On a clear day, Mount Elgon could be seen occasionally tipped with snow. ( Stella's eldest sister ) was Dame of Honour, wearing a lovely blue chiffon dress with silver spotted sleeves and a flower hat. Alice Luck was the flower girl and her brother was the page boy. Alice was wearing a Victorian frock of blue net with a flower head-dress and carried a sweet pea posy while her brother John was in a trim white satin suit. All too soon, in February, Mac was posted to Lusaka. 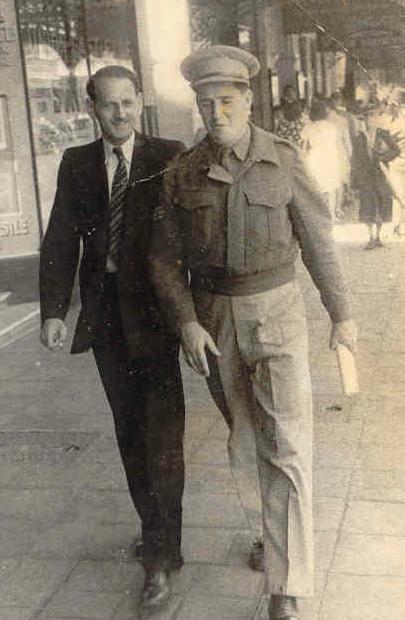 His convoy took five days travelling in three ton trucks through Tanganika to Northern Rhodesia. Stella followed in April but the long rains had arrived and the convoy was stuck in mud for fourteen days. The first day Stella and three WAFS travelled in the back of a truck which was belching out diesel fumes. They were so sick and green that after that they were permitted to travel in the front cab. Their main duty was to keep the driver awake with sweets, biscuits and cigarettes. Stella was driven by a seasoned driver who was inclined to ignore caution. Just after Dodoma there is a very steep drop into the Rift Valley. At the top of the escarpment, all drivers received strict instructions to keep the three tonner in first gear. Half way down Stella's driver suddenly decided that progress was to laborious and slipped into neutral. The lorry shot past everyone and by the bottom was travelling in excess of sixty miles an hour. Parts of the vehicle were beginning to drop off as the lorry exceeded its normal top speed by 20 - 30 miles per hour. Stella will still press down on nonexistent brakes when sitting alongside a driver. 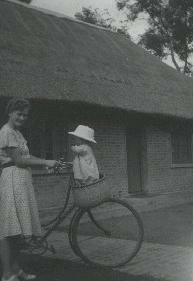 In sharp contrast, Stella with Alice (daughter of Stella's sister Pat photograph left ) in the basket on the bike making a return visit to the farm in Kitale. It is hard to appreciate the great distances travelled and the disruption that the war caused. Mac's and Stella's son David was born in Kitale on 25th June 1944. One year 10 months later, Michael was born in South Africa and one year 10 months later, daughter Jean was born in Kitale. Then there was a long wait of fourteen years for son James to be born in Nairobi. 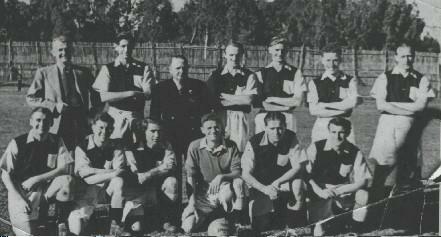 Mac captained the South African Football team against the Italians in Rome. In hot conditions the South Africans were relaxed and fast, keeping the Italian's goal under constant pressure. The winning goal, however, only came in the last quarter of the game. 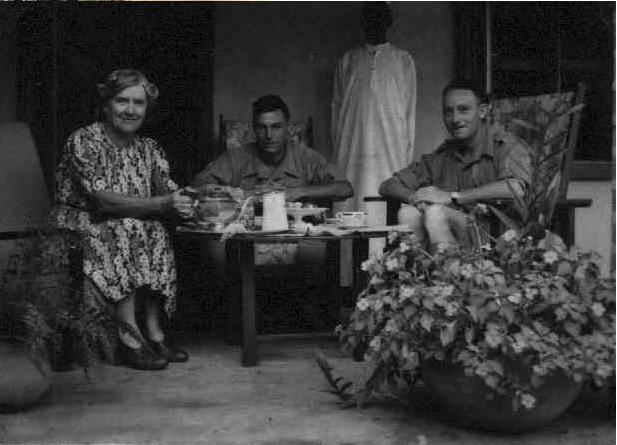 Mrs E M Thomson entertaining Officers of troops based at Lokitung. 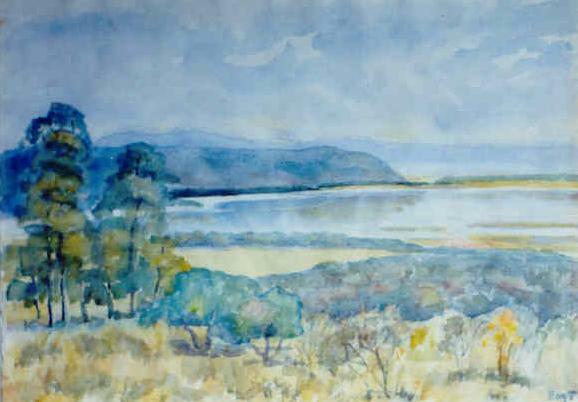 Also a favoured position for her to paint a water colour with Mount Elgon providing a impressive backdrop. 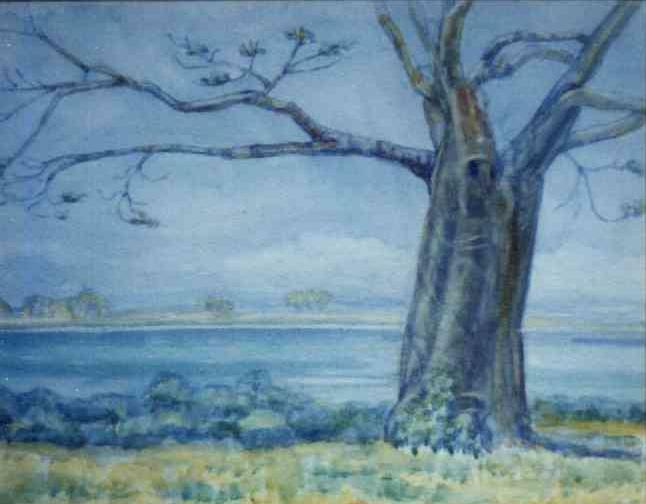 Other water colour paintings by Mrs E M Thomson. Christmas was an important time for Mac. How many children have a father who flies in as Father Christmas. 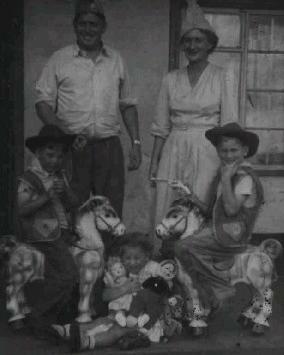 Christmas 1952 was very special for two young cowboys with sister Jean and her dolls. 364 Kileleshwa was one of the many houses in Nairobi that was home to the McFarnell family. Mac was keen to develop the sporting skills of all his children and their friends. 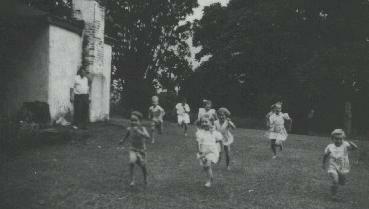 Handicap races at the farm in Kitale at Christmas time were followed by the giving of presents to all the Watu (people) on the farm. A ritual had become established when all the staff came up to the house to receive their presents from my grandmother. Dressed in their finest maradadi clothes, dancing and moving to the rhythmic beat of drum a single line progressed up from the diary to the house. The men received a shirt, a bag of sugar, a bag of flour, a pack of butter and a bag of posho. All clothes were hand sewn so in addition, small patches were also included. These were greatly valued and were used to patch garments. At times you suspected that holes were covered that did not exist. The local brew of pombe was consumed and celebration continued well into the night with much singing and dancing. Mac's and Stella's first car was called "snubnose". In the above picture we have from the right, Lillian, David, Mac, Jean, Mike and Stella. The journey from Nairobi to Kitale took ten hours. Nairobi to Nakuru was on tarmac but then it turned to dusty gravel and catch the rainy monsoon season became sticky treacle mud which cars found very difficult to negotiate even with chains on the wheels. With Stella driving "Snubnose" and Mac pushing, we slid pass the big heavy and expensive cars stuck in the mud. 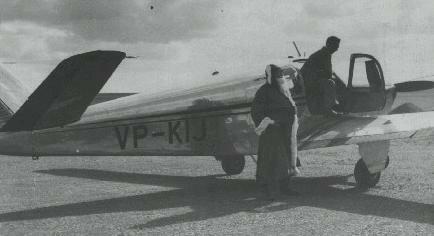 The other great event at Christmas time was greeting arrivals to the farm. The custom developed where anyone approaching the farm was to sound the horn as they crossed the river on the road leading up to the farm. We clustered at the top gate of the farm then tore down the double track lane to announce the new arrival. 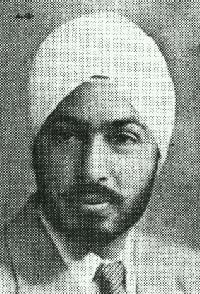 Mac's greatest friend was Jasmer Singh, who joined the Public Works Department, P.W.D in 1947 and started cricket, hockey and mixed hockey. He always took a keen interest in the administrative and field side of sport within the Department ( name changed to Ministry of Works, M.O.W. in 1956. He was secretary to the Kenya Federation of Sport and, together with Mac, started the Commercial Cricket League. His contribution to cricket in Kenya was enormous. He played in six internationals and is the holder of 307 runs record for the first wicket for Sikh Union ( now Simba Union ) against Nakuru Athletic Club. The Internationals included Kenya against Gujerat & Sunder C.C. in 1957 and South Africa Non-Europeans in 1958. In 1975, he was appointed to manage Kenya in the first Cricket World Cup in Britain and in 1996 managed Kenya in the World Cup in India / Sri Lanka. He was Chairman of Kenya Cricket Association from 1970 to 1977. He travelled many times to Britain and always took time to meet up with Mac. In August 1999, Jasmer became General Manager of the Kenya Cricket Association. The following small article in the Sunday Post in May 1950 recognised, the first vital step taken by Mac to realise his dream to give all sportsmen and women in Kenya an opportunity to play against each other without the racial and religious divide that had for so long made it difficult. The discipline of employment and possible retribution ensured that prejudices were held in check. Here he found a person, Jasmer Singh Grewal who not only shared his vision but became a great friend. 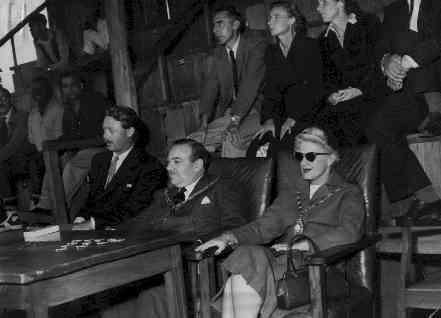 Together they had the Nairobi Commercial Cricket League formed ready to start as soon as the football season finished. Much of the ground work and contacts within the businesses had been achieved. Mac and Jasmer were highly respected as sportsmen and quickly gained a reputation as sports administrators. The Leagues ran with smooth efficiency and the many problems of violence and confrontation was removed by the strong threat of discipline by the employee. The plan for semi-professional football in Kenya yesterday became clearer for it was announced that the three men mainly concerned in the venture are long time soccer stalwarts Jimmy McFarnell, Issac Lugonzo and Maurice Wright. And so experienced are these three wise men that they are not rushing into the project. Already Mac has spent eighteen months working on the project and they have no intention of opening their league before April 1963. Kenya Independence and the pace of change unfortunately did not see the implementation of this project. Suddenly all Civil Servants were confronted with an option to receive compensation and return to England or take their chances in the new emerging Kenya. Mac put family first in the decision to move to England. There is no doubt that his heart remained in the Country that he loved. 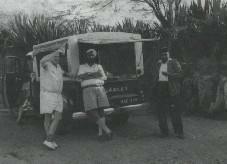 Mac became a great friend of Sir Stanley Mathews when he came to Kenya in 1956. Stanley was able to relate to the vision, beliefs and aspirations that Mac held to improve sport for all regardless of colour and religion. Stanley did not want to play exclusively with the white teams. He demanded to be able to play, train and coach with anyone and Mac ensured that the stadiums were packed with representatives from all races. In fact, I travelled alone in the taxi back to the hotel with the kit bag because Mac and Stanley went off to a big function. In Soweto, South Africa, he trained an all-black schoolboy team, "Sir Stan's Men". Those South African links brought him much pleasure, but they were not universally appreciated while apartheid held sway, and he was banned, for instance, from attending a Sportsman of the Year contest in Zimbabwe in 1985. Sir Stanley Matthews, CBE, footballer, died yesterday aged 85 on 23rd February 2000. Born on 1st. February 1915 Stanley Matthews was the most famous of all English footballers, and perhaps the greatest of all wingers. Other players may have come close to matching his celebrity or his skills, but none has been held in such affection or esteem. As a symbol of all that is best in the game he was beyond compare. His professional longevity, too, is unlikely to be challenged. He was past 50 when he played his last league game, yet he felt that he had retired several years too soon. Mac and Stanley stayed in touch, but Mac never took advantage of their special friendship especially when Mac came to England. As a symbol of all that is best in the game he was beyond compare. His professional longevity, too, is unlikely to be challenged. He was past 50 when he played his last league game, yet he felt that he had retired several years too soon. Mac and Stanley stayed in touch, but Mac never took advantage of their special friendship especially when Mac came to England. 'The Clown Prince of Soccer'. Len Shackleton was born in Bradford on 3rd May, 1922. In 1946 - 47, he made 57 appearances for Newcastle United and scored 25 goals. 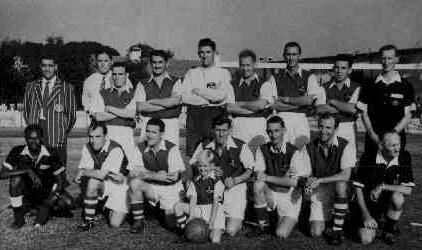 Then he joined Sunderland for ten years 1947 - 57 and made 320 appearances and scored 98 goals. Favouring an inside-left position, he gained five England caps. Of his five international caps, perhaps the most famous was against the then World champions West Germany in 1954 when England recorded a 31 victory. There was another period in Mac's life when he drove for hours over the corrugated, dust or mud covered roads under the magnificent backdrop of Mount Kenya to pay out to the Public Works department project teams. It was sitting behind a wheel for hours and the need to quench a raging thirst caused by dust and heat that contributed to the substantial figure. In the photograph Mac, his relief driver and the Project Engineer, Sham Singh and me aged eight stopping for a well deserved break on the roadside somewhere between Machakos and Voi. In preparation for one of these trips all old tennis balls were gathered up from the tennis club in Nairobi so that they could be distributed to the young natives in the villages. This included a demonstration of kicking with both feet against the wall of a mud hut, and ball control from head to knee to feet. Bwana Macuba ( big man ) could still impress the large audiences of young aspiring football players. Mac was never robbed although he carried large sums of money to pay out to project teams in the bush. On reflection, I think his love of sport may have helped stop him from becoming a target. My fond memories of these trips in the long school holidays were the collection of a vast treasure of stones from the dry river beds. Sham Singh endeavoured to arrive at sites on time. The last hour of any journey reflected this ambition to the time scheduled. When late, he drove at speed but if early, he drove at a snail's pace which included refreshment stops which gave me the opportunity to explore the dry river beds to add to my collection of stones. Another project undertaken by Mac was to build kicking walls. He believed that the wall allowed youngsters to develop skills by practicing with a ball. It did not matter whether it was a football or a tennis ball. His great skill at kicking a tennis ball with both feet was impressive to watch. Many walls carried a grid of squares, marked with numbers. Now the game became a real challenge. I only saw Mac score twenty once but he was very capable of hitting over half of the randomly placed numbers. The Milk Marketing Board sponsored two walls in the poorer areas of Nairobi with a prize for anyone striking the twenty white milk bottles on the wall. I was never aware that anyone achieved the full twenty. The wall provided an opportunity for individuals to meet others. Certainly for tennis it was a good way to find someone to play against. The Mau Mau held sad memories because it was a time when people who had been trusted could no longer be trusted. The Kikuyu race, under the leadership of Jomo Kenyatta were fighting for independence. Ordinary people were made to commit horrible inhuman acts out of fear. 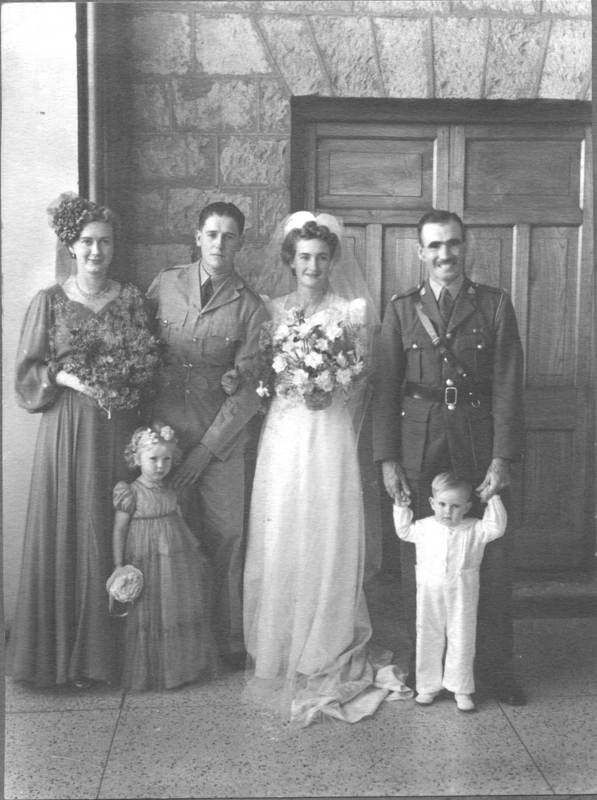 Mac and Stella had engaged a children's nurse to look after their daughter Jean. 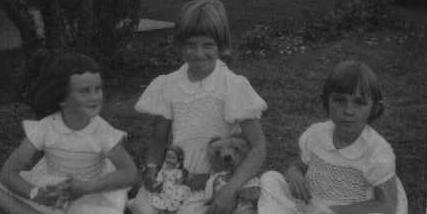 Lillian was a beautiful and gentle person who also looked after my brother David and me when we had chicken pox, mumps and measles. 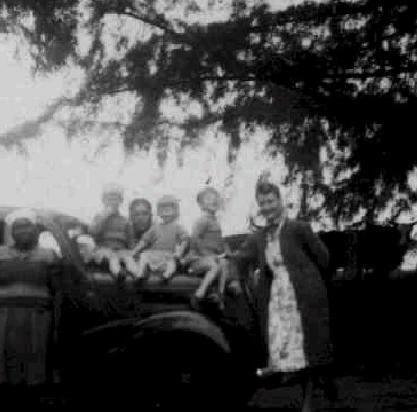 At the height of the Mau Mau, all Kikuyu were taken into detention and this included Lillian. 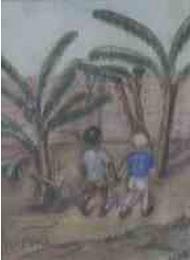 The Police swooped one dark night and led Lillian, our cook and his assistant off to the detention camp. 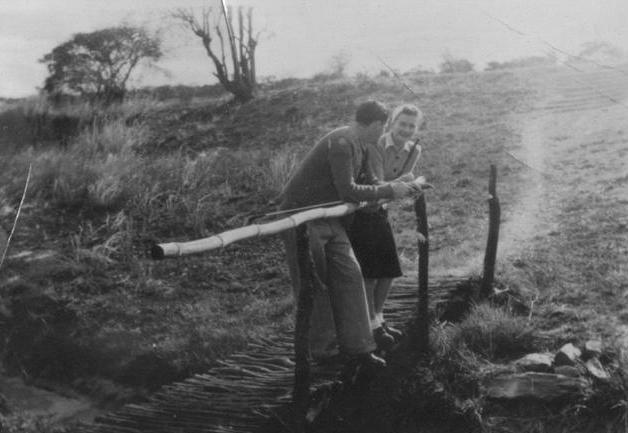 Mac never felt threatened by the Mau Mau and when called upon to walk patrol indulged himself by carrying a driving wood. The other members of the patrol came armed to the teeth with rifles and hand guns. As Mac mentions in his letter to Nelson Mandela (page 59) Jomo Kenyatta sent him a message when he heard the family was leaving Kenya in 1963 which said " Mac you are one Mzungu ( European ) who can come back to Kenya without a re-entry permit". President Jomo Kenyatta, (left) who died in August 1978 at an approximate age of over eighty, became Kenya's Prime Minister in June 1963. To the Africans he was known as "Burning Spear". Mac, who met Kenyatta on numerous occasions said that he possessed a genius for oratory when addressing large crowds of Africans that was almost Hitlerian, enforcing the image by waving his elephant headed stick and fly whisk. Kenyatta professed to be searching for a synthesis of the old Africian and new Western ideas. He defended primitive Kikuyu customs insisting there was much value in the old pagan ways. In his later years, Kenyatta became affectionally known as Mzee " the Grand old Man " and although not a sportsman saw the political advantages of sports success on the world stage.